Remember last week when I mentioned how incredibly excited I was to win my first blog award? To a people pleaser like me, that kind of stuff is epic. A compliment, especially from someone I like and admire, can provide a spring in my step that lasts for days. So, while I'm still feeling all warm and fuzzy, I want to pay the positivity forward. However, rather than pass on the award I was given, I decided to create my OWN blogger recognition. The longer I read blogs the more I realize that the most compelling posts are the ones where the author is truly transparent. Don’t get me wrong… I love to laugh, I love to learn something new and I love to connect with other bloggers through contests and round ups. Those posts are always fun because they brighten my day and undoubtedly keep me coming back for more. But I cannot get enough of posts where the writer bares all. I think I respect and enjoy them so much because I know how tough it is to be honest and unguarded without coming across as whiny, critical or like you’re totally consumed with self. It takes guts to expose yourself to your readers. Sometimes I fear that the best stuff I write gets edited out to satiate my fear of being judged or misunderstood. Let’s be honest, bravely sharing the naked truth about yourself and your life is difficult to do – especially when you leave the comment section open! There are a ton of bloggers out there that boldly exhibit tremendous transparency without getting all mushy gushy or self-indulgent. And to a reader like me, a post like that is a thing of beauty. That’s why today I'm presenting the first ev-ah Tremendously Transparent Award to Cara over at still. pictures. Cara writes about all kinds of stuff going on in her life, (and right now there seems to be a LOT of stuff) but I'm always most drawn in by her more confessional posts. You should really take a minute to stop by and check out her blog. 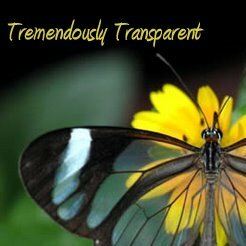 You’ll be inspired and encouraged by her writing because she truly is tremendously transparent.